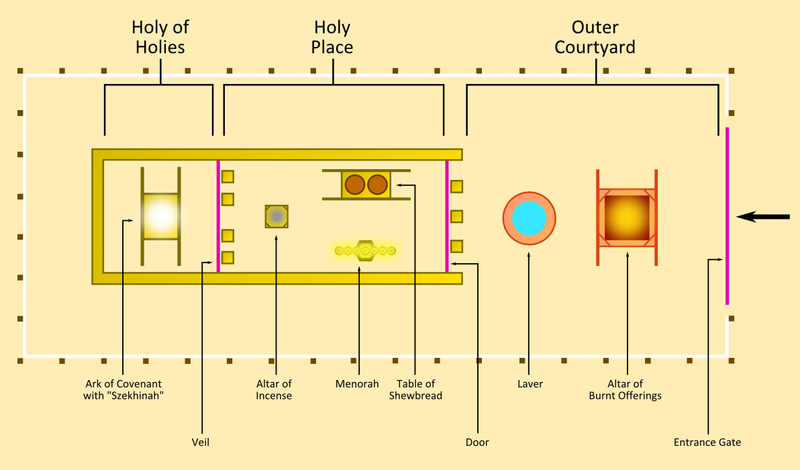 So far we have made our way through the Outer Court of the Tabernacle and into the golden fellowship of the Holy Place. above us on the four meter high Veil as if to protect the Most Holy Place. 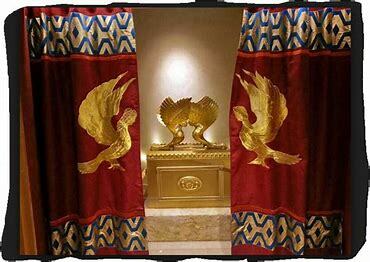 On the other side of the Veil is the Ark of the Covenant – where the presence of God, or the Shekinah glory, dwells. 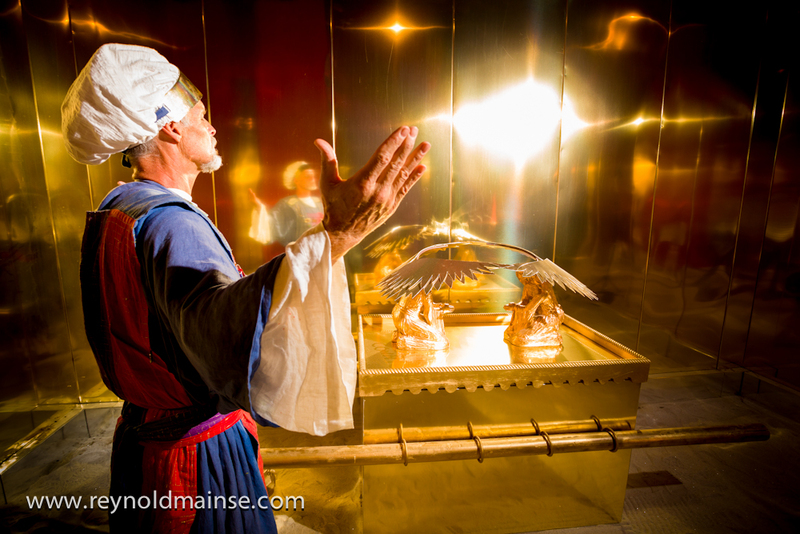 The Ark of the Covenant was the throne of God on the earth and it was awesome in its majestic holiness. But we will see the beauty and divine truths of the Veil too, of how once again it is a picture of God’s precious Son Jesus Christ and His work to remove the separation between God and man. In contrast to the Door as the access point into the Holy Place, the Veil was rather a curtain of exclusion. 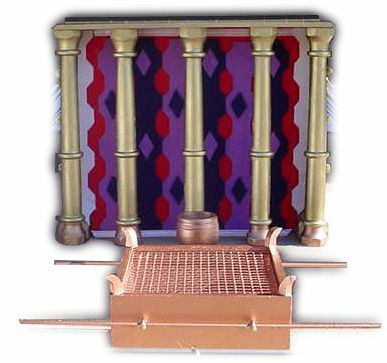 It was designed to keep anyone from entering the holy presence of God in the Holy of Holies and thus keep sinful man from polluting the Holy presence of God. Only once a year on the Day of Atonement could one man, the High Priest, enter the Holy of Holies and not without blood. Therefore even the priests daily ministering unto the Lord within the Holy Place could not access the Most Holy Place through the Veil. The Veil had inwrought Cherubim on it. Cherubim are not merely angels, they are seen throughout scripture in relation to types of the Godhead, Father, Son and Holy Spirit. Cherubim speak to us of the Holiness of God. 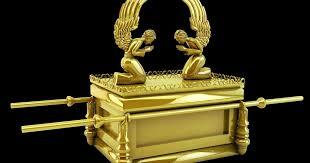 It is Cherubim that are wrought from the gold of the mercy seat and are thus overlooking the Ark of the Covenant. It was Cherubim that guarded the Tree of Life with a flaming sword after Adam and Eve were expelled from the Garden of Eden. And just as the Cherubim prohibited sinful man accessing the Tree of Life, so too they prohibit entry into the Holiness of God. The Veil was made of woven blue, purple, scarlet and white fine linen. Four pillars supported the Veil. These were made of acacia wood and overlaid with gold. The sockets for the door were made of silver. Acacia wood overlaid with gold is such a beautiful picture of Christ. The incorruptibility and earthliness of acacia wood signified His incorruptible (sinless) human nature and the gold signified His heavenly divine nature. Both God and Man in the one Person. Whereas the Door into the Holy Place had five pillars, the Veil was upheld by four pillars. The five pillars upholding the Door were founded in sockets of Brass, however, the four pillars upholding the Veil were in sockets of silver. Brass speaks of judgment, whereas silver speaks of redemption. The silver used to create these sockets would have come from the Israelites redemption money (Numbers 18:15, 16) and so the Veil literally stood in redemption metal. Thus we see the Veil’s effectiveness in keeping sinful man separated from a holy God. Sinful man could only enter through the Veil once a year on the Day of Atonement, with the blood of an animal shed as substitutionary atonement for the sin of the High Priest as well as Israel. If any tried to enter the Most Holy Place by any other means than God’s proscribed way he would be struck down dead immediately. We see it is no trifling matter to approach God in His majestic holiness. We see He is to be approached with awesome reverence, something much of the professing Church is missing nowadays. To approach Him lightly is to make light of the blood of Christ. Just like the substitutionary animal, someone had to die for us to be able to approach the Throne of Grace. And not just anyone, God. God died so that we could approach Him. We see that as the Veil, Christ, as the second person of the Godhead, stands in the gap between Holy God and sinful man. We see that He is the way through to the Most Holy Place, the awesome majesty of God. It is only through His torn flesh that we can approach God. It is through the blood that He shed on the cross that we can now come before the Throne of Grace. We must go through the Veil to approach the Father. Remember the Veil stood in redemption metal (silver) and so it is by personal faith in Jesus Christ and His redemptive work on the cross that we are saved. There is no other way in to the Holy of Holies, no other door, no other Veil. It was when Jesus died, and that Veil was torn from top to bottom, that the way was made open for sinful man to be able to enter God’s presence. What an immeasurable honour that we can approach God now and boldly! That word “boldly” means “freedom in speaking, unreservedness in speech; openly, frankly, i.e without concealment; free and fearless confidence, cheerful courage, boldness, assurance”. Because of Jesus Christ’s earthly work at the cross we can now approach God as a child approaches his father. We can go with full assurance that in Christ we are acceptable to Him. We will not be rejected because we are no longer sinful in His sight, but we are now the righteousness of God in Christ Jesus. 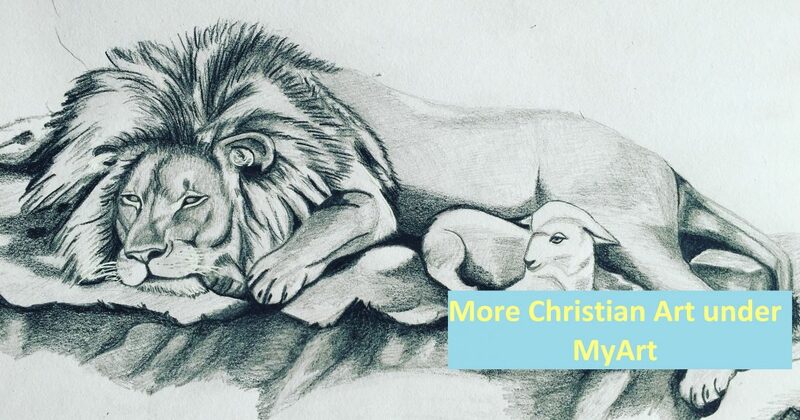 Christ Jesus is truly our Great High Priest. He stood in the gap for us, He paid the penalty of sin for us and He made the way open for us. Hallelujah to the Lamb! Categories: Jesus and The Tabernacle | Tags: Christ, Christian, Christianity, Holy, holy of holies, Jesus, Moses, most, place, separate, sin, tabernacle, veil | Permalink.